Luther Price, Sorry Horns (handmade glass slide, 2012). It’s commonly said that any substantial-sized film festival is really many festivals. Each viewer carves her way through a large mass of movies, and often no two viewers see any of the same films. But things scale up dramatically when you get to the big boys: Berlin, Cannes, Venice, and Toronto. I’ve never been to the first three, but my first visit to TIFF was like wading into pounding surf and letting the current carry me off. This is the combinatorial explosion of film festivals: A hefty 450-page catalog listing over 300 films from 60 countries. Moreover, because it’s both an audience festival and an industry festival where movies are bought, sold, and launched, you observe a range of viewing strategies. Although I sit too close to be much bothered, my friends tell me of mavens darting in and out of shows or checking their cellphones during slow stretches of what’s onscreen. The crowds add to the air of electric excitement, as of course do the visits of glamorous celebs. So I was inundated. How to choose what to see in 3 ½ days for viewing? (I reserved time for industry panels.) I knew that some of the prime titles, such as Kiarostami’s Like Someone in Love or the remarkable-looking Leviathan, would be available for Kristin and me at Vancouver later in the month. And I saw no reason to stand in queues for Looper, Argo, and other movies that I could see in empty Madison, Wisconsin multiplexes during off-peak hours. I still missed many, many things I wanted to catch. For much wider assessment of major movies, you should go to the coverage offered by the tireless scouts of Cinema Scope and the no less tireless scouts of MUBI. Here I’ll talk just about a few films that made me think about—no surprise—digital vs. analog moviemaking. Stephen Tung Wai’s Tai Chi 0 (0 as in zero) represents everything we think of when we say that digital production and postproduction have transformed cinema. This kung-fu fantasy from the Chinese mainland (but using Hong Kong talent, including the director) retrofits the genre for the video-game generation. CGI rules. The result is, predictably, monstrous fantasy—a globular iron behemoth, a sort of Steampunk locomotive version of the Death Star—but also screens within screens, GPS swoops, tagged images, Pop-Up bubbles identifying the cast, and other scribbling that turns the movie screen into a multi-windowed computer monitor. One more thing Scott Pilgrim must answer for. Jang Sun-woo played with similar possibilities in his 2002 Resurrection of the Little Match Girl, inserting character dossiers and creating digital effects mimicking gamescapes. But he sometimes paused to give these images a dreamlike langor. Tai Chi 0 never lingers on anything and instead carries the level of busyness to crazier heights. In a panel at the Asian Film Summit, Fung explained that one scene of the film was inspired by a particular online game. Sammo Hung was playing Fruit Ninja or something similar and Fung decided to include a scene of villagers turning away invading soldiers with a barrage of produce. Fung said as well that fantasy martial arts remains a blockbuster genre in the PRC (viz. the success of Painted Skin: The Resurrection). Tai Chi 0 ends on a cliff-hanger, the end titles (rolled too fast to read) provide a trailer for part 2, and apparently a third part is in the works. Now China has franchise fever. The stop-and-start plot is familiar from Hong Kong films of the 70s onward (including over-made-up gwailo villains), but its execution wrecks nearly everything I like about classic kung-fu movies. Clearly though, I’m not in the audience the movie is aimed at. My friend Li Cheuk-to, artistic director of the Hong Kong International Festival, opined that this digital froth could be very appealing to China’s online generation. Tai Chi 0 exemplifies what academics writing on digital have talked about as the “loss of the real.” As Tom Gunning pointed out back in 2004, though, things aren’t so simple. Digital photography, after all, remains photography. The lens intercepts a sheaf of light rays and fastens their array on a medium. The fact that a shot can be reworked in postproduction doesn’t mean that every digital image must surrender the tangible things of this world. At TIFF, the power of digital cinema to bear witness was on display in Sion Sono’s Land of Hope. 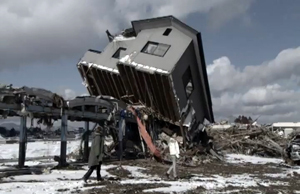 Sono has already documented Japan’s 2011 earthquake and tsunami in Himizu, which I haven’t seen, but in that and Land of Hope, he abandons the wacko bad taste that made Love Exposure and Cold Fish so memorable. This is a sober, traditional drama presented with straightforward economy. It takes place in a fictitious district, Nagashima, but the fact that the name combines “Nagasaki” and “Hiroshima” suggests the gravity of Sono’s approach. Three couples’ lives are torn apart by the quake, the tsunami, and the collapse of the nearby nuclear power plant. (All of these catastrophes are kept offscreen, glimpsed in TV reportage.) The oldest couple refuses to evacuate, clinging to their farm. Their son and his wife move to a nearby city where they succumb to the fear of radiation affecting their unborn child. And an unmarried couple wander the ruins looking for the girl’s father. Sono intercuts the three lines of action. The old farmer adroitly manages his wife’s dementia and lets her indulge her fantasy of dancing in a village festival. In a critique of Japanese conformity, the young couple is shown being mocked for their worries about radiation poisoning. (The wife seals their apartment and, in a touch recalling the grotesque side of Sono, takes to wearing a Hazmat suit.) Less sharply developed are the fairly aimless ramblings of the youngest couple, though Sono injects some suspense when they dodge police blockades. At intervals, plaintive Mahler (a Sono weakness) surges up to underscore the futility of their search. Throughout, government reassurances and the media’s insistence on putting on a happy face are treated with robust skepticism. Instead, Sono celebrates a dogged persistence to get through each day. The young couple’s mantra of “one step, one step” supplies the upbeat tone of the last scenes. As affecting as you’d expect is the footage of areas around the plant, seen as a wintry wasteland. Like Rossellini filming in bombed Berlin in Germany Year Zero, Sono has shot precious footage of ruins that testify to a calamity in which nature conspired with human blunders. And he did it digitally. 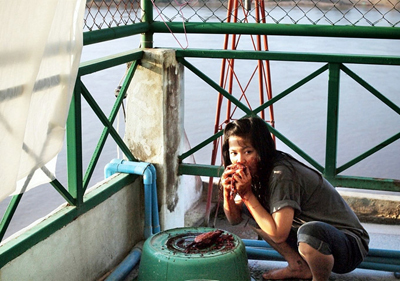 You can’t expect something so conventionally dramatic from Apichatpang Weerasethakul, and Mekong Hotel doesn’t supply it. It’s as relaxed as Tai Chi 0 is frenetic, and its central conceit makes it another pendant to Uncle Boonmee. The boy Tong and the girl Phon meet from time to time on the terrace of the hotel overlooking the river. They talk about folk traditions and the flood then besieging Thailand. They also encounter spirits that are as tangible, even mundane as they are; Phon’s dead mother appears in her room occasionally knitting. More shocking are the ghosts called Pobs who seem to possess the characters and make them hunch over and gobble intestines, sometimes in situations that suggest the organs have been torn from another character. All these scenes are handled with the usual Weerasethakul tact: long-take long shots, usually one per scene, that push the everyday and the extraordinary to the same unruffled level. Mekong Hotel seems to operate on two planes of time. On the image track and in the dialogue, we witness Tong and Phon on the terrace or walking along the river. But the music, snatches of repetitive guitar tunes, seems to come from another time frame. 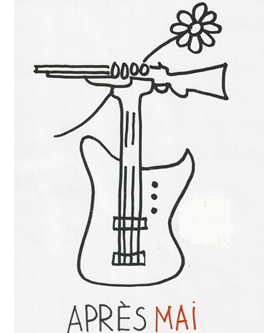 At the start we see a guitarist practicing, and his noodlings run almost constantly under the drama we see. Another motif, fixed and lustrous shots of the Mekong River, yields a visual if not dramatic climax: a slowly paced choreography of Jet-skis crisscrossing the water. Here the digital medium may work to Weerasethakul’s advantage, with the clouds and landscape hanging unmoving over the racing watercraft, as a single, slow ship wades into the middle of their oscillating geometry. 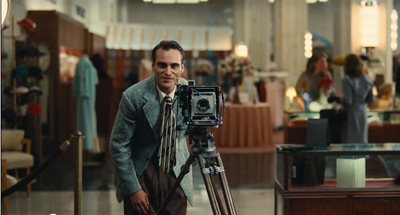 I suspect that Olivier Assayas filmed Something in the Air (originally Après Mai) on film, but even if he didn’t, the movie is a tribute to analog reproduction–mimeograph machines, LPs and turntables, and cinema in its different guises, from exploitation films to agitprop and experimental lyrics. We all know that the 1960s continued well into the 1970s, and here Assayas shows the uneasy carryover with a mixture of sympathy and critical detachment. The film starts with our high-school protagonist Gilles carving a peace symbol into his desk, flagrantly ignoring the teacher’s lecture. The shot encapsulates the film’s tension between political activism and image-making, and Gilles will oscillate between them in the course of the plot. The poles come to be represented by two young women—the wealthy and ethereal Laure for whom he makes his paintings and the more hardheaded leftist rebel Christine, who goes out with him and others on nightly graffiti raids. When Laure leaves for London, Gilles continues his painting while leafleting and splashing slogans on walls, with the occasional Molotov cocktail to spice things up. The copains’ rebellion leads to some harm, but they cling to their ideals. When summer comes, Gilles joins a film collective headed to document workers’ struggles in Italy. He encounters the arguments that made me smile in nostalgia: Shouldn’t revolutionary content have a revolutionary form? But how shall we reach the working class if our films are opaque? Assayas, who grew in this period and was repelled by the Maoist dogmatism of Cahiers du cinéma and Cinéthique, evokes these debates to remind us that the counterculture was about art and political change at one and the same time. Something in the Air chronicles a few years when imagination mattered. After an early, shocking clash of students pounded down in a police riot, the film adopts a more circumspect rhythm, salting its scenes with books, magazines, record albums, and songs of the time. The plot keeps our interest by delaying exposition about the characters’ family lives until rather late. When we learn that Gilles’ father writes scripts for the celebrated Maigret TV series, we’re invited to see his forays into abstract painting as his form of teen rebellion. The plot doesn’t mind straying a bit from Gilles, as when his friend Alain, another aspiring artist, gets caught up in the fervor and pursues a wispy red-haired American dancer. Characters meet, work or play together, drift apart, re-converge, and eventually settle into something like grown-up life. But at the end, when Gilles has apparently been absorbed into commercial filmmaking in London, he is granted one last vision of one of his Muses, who reaches out for him from the screen of the Electric Cinema. Analog triumphs as well in The Master. Sitting in the front row of Screen 1 at the TIFF Lightbox (see below), I was astonished at the 70mm image before me. Not a scratch, not a speck of dust, not a streak of chemicals, and no grain. So did it have that cold, gleaming purity that digital is supposed to buy us? Not to my eye. The opening shot of a boat’s wake, which will pop up elsewhere in the movie, was of a sonorous blue and creamy white that seemed utterly filmic. Now we know the way to make movies look fabulous: Shoot them on 65. The Master, as everybody now knows, centers on Freddie Quell, an explosive WWII vet, and his absoption into a spiritual cult run by the flamboyant Lancaster Dodd. Followers of The Cause are encouraged, through gentle but mind-numbingly repetitious exercises, to probe their minds and reveal their pasts. 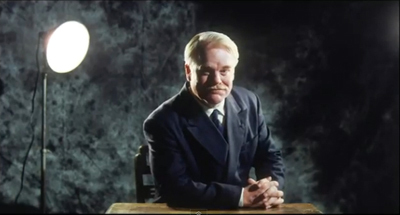 With the air of a charming rogue in the young Orson Welles mold, Dodd seems the soul of sympathy. But like Freddie he’s capable of bursts of rage, especially when his methods are questioned. Freddie becomes a sidekick because of Dodd’s fondness for his moonshine, while he also serves as a test case for the efficacity of The Cause’s “processing” therapies. If you can get this hard-bitten, borderline-sociopath in touch with his spiritual side, you can help, or fleece, anybody. Like There Will Be Blood, this movie is primarily a character study. That film gained plot propulsion from Daniel Plainview’s oil projects, but many situations worked primarily to reveal facets of his dazzling self-presentation, his repertoire of strategies for dominating others. Something similar happens with Dodd and the ways he charms his congregation. But here the action is more episodic and the point-of-view attachment is dispersed across two characters. Dodd’s counterbalancing figure, the clenched Freddie, is so difficult to grasp psychologically (at least for me) that the film didn’t seem to build to the sort of dramatic, even grotesque peaks we find in other Anderson projects. This is also a story about an institution, a quasi-church with a pecking order, rules, and roles. I wanted to know more about how The Cause worked, how it recruited people, and how it garnered money. Laura Dern plays a wealthy patron who lets the group stay in her home, and at one point Dodd is arrested for embezzling from the foundation, but the details of his crime aren’t explained. I also wanted to know more about the group’s doctrine, which seems so vague that Scientology need not worry about being targeted. The rapid-fire catechisms between Dodd and his acolytes are gripping enough, as Q & A dialogue usually is, but what system of beliefs lies behind them? The film seems to fall back on the familiar surrogate father/son dynamics at the center of most Anderson movies, but here filled in less concretely. In short, after one screening I was left thinking the film was somewhat diffuse and flat. But I need to see it again. I thought better of Boogie Nights and Punch-Drunk Love after re-viewing them, so I look forward to trying to sync up with The Master on another occasion. Alas, in Madison, Wisconsin, I won’t have a 70mm image to entice me. Luther Price, No. 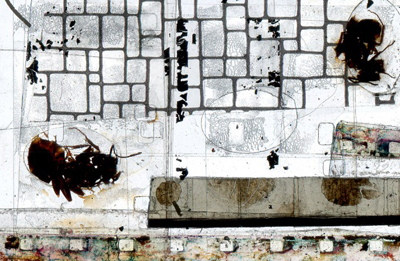 9 (handmade glass slide, 2012). Analog imagery came into its own on other occasions, notably during the two programs of experimental films gathered under the heading “Wavelengths.” (At one I spotted Michael Snow in the audience.) Expertly curated by Andréa Picard, these programs assembled some strong, provocative films by several young filmmakers. I won’t review each one here–Michael Sicinski provides very useful commentary on nearly all those I saw—but I must mention the striking slide show that served as an overture one evening. The images didn’t move, exactly, but they might as well have. Luther Price has been making remarkable films on 8mm and 16mm for several years, and one Wavelength program featured his Sorry Horns, a three-minute mix of abstraction and found footage. The same mix was evident in the procession of stunning handmade glass slides. 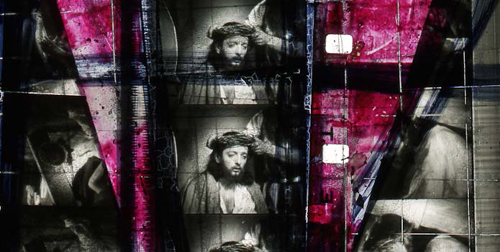 Many, like the one surmounting today’s entry, evoke early cinema, decay, and clichéd Christian imagery: the wounds of film deterioration become cinema’s stigmata. Even the sprocket holes and soundtracks are invaded by festering particles. Arp-like blobs, pockmarked faces, and spliced and sliced movie frames lie under grids as irregular as medieval leaded windows. This is all gloriously analog. No less captivating is the new, 100% digital work of an even older master of American avant-garde cinema. In one Wavelengths program Ernie Gehr offered us Departure (2012), a train trip playing on optical illusions in the spirit of Structural Film. We all know what it’s like to sit on a stationary train but then feel, when another train passes, as if we’ve started to move. 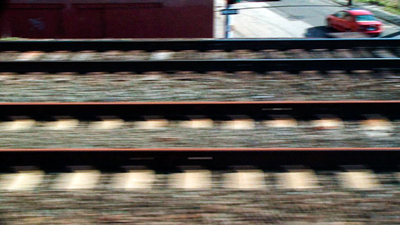 Gehr translates this kinesthetic illusion into optical terms by filming, first upside down and then in judicious framings, several railbeds rushing by, faster and faster. These layered ribbons sometimes unfurl right, sometimes left, and sometimes simply hover there as fixed, pulsating strips, all but losing the details of rail and tie and spike. Sometimes the one on top moves right, the grass verge beside it moves left, and the bottom track moves right (or left). This creation of flip-flop movement harks back to Side/Walk/Shuttle (1991) and to Gehr’s 1974 exercise in traffic abstraction Shift, which filmed patterns of commuter traffic from a very high angle. 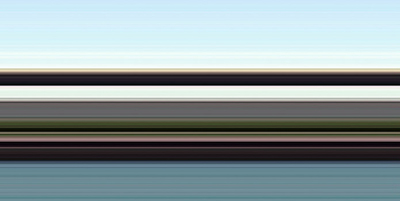 Accompanying Departure was one of nineteen pieces in Gehr’s Auto-Collider series. Most of them contain some recognizable imagery, Gehr explains, but not number XV, the one we saw. In a sense the distilled essence of Departure, that film’s whooshing planes become vibrant, and vibrating, stacks of bold color, a bit like Daniel Buren in a joyous mood. How did Gehr create the gorgeous Auto-Collider images? He declined to explain. Kristin suggested a plausible means to me, but I’m keeping quiet. In the analog age, when new methods of abstraction required a lot of sweat equity, filmmakers freely explained their painstaking work with lenses, light, and optical printers. But digital video practice flattens the learning curve. Powerful discoveries like Gehr’s or Phil Solomon’s are very easily replicated without much time, toil, or talent. Hell, somebody would make an app for them. These artists are right to have trade secrets, just as magicians do. We should be satisfied merely to look. What we see reminds us that both analog and digital media harbor possibilities that go beyond the ability to replicate phenomenal reality. Both media can also dazzle us with things we’ve never seen, or imagined. 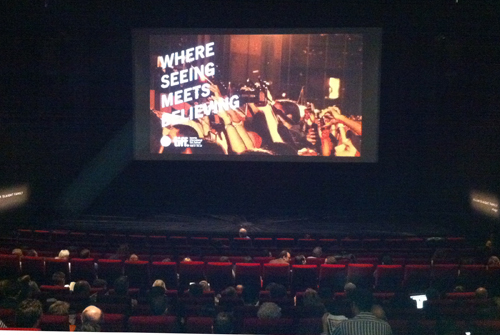 Digital projection seems to be taking over the festival scene, if TIFF is any indication. Cameron Bailey reports in a tweet that of the 362 films screened, 232 (64%) were in the Digital Cinema Package format and another 79 (21%) were in HDCam. The remainining 51 (15%) were in 16mm, 35mm, and 70mm. Are the digital items still films? Robert Koehler suggested that maybe we will start calling everything movies. Interestingly, at the Wavelengths screenings, the artists called their artworks (whether on film or on digital video) “pieces.” Me, I still vote for calling films films, even if they’re on video, just as we have books in digital formats (such as, oh, I don’t know, this one). For me, at least these days, a film is a moving-image display big or small, whether it’s on film or some other medium. For some purposes we may want to specify further: Just as e-book and graphic novel indicate a platform or a publishing format, TV movie or video clip tells us more about what kind of film we have. See also my January entry on festival problems with digital projection. Thanks to Cameron Bailey, Andréa Picard, and their colleagues for enabling my visit to TIFF. The industry screening of The Master at TIFF. Photo by M. Dargis. This entry was posted on Thursday | September 13, 2012 at 2:19 pm	and is filed under Digital cinema, Directors: Anderson, Paul Thomas, Directors: Weerasethakul, Experimental film, National cinemas: China, National cinemas: Hong Kong. Responses are currently closed, but you can trackback from your own site.